DO NOT READ THE FULL REVIEW unless you want to know how the story turns out before actually reading the novel. – Jose Neil Garcia – Judge, Palanca Awards– in his decision to award the award the 2011 Palanca Awards Grand Prize for the Novel to In The Service of Secrets, later re-titled The Mango Bride. The Carlos Palanca Memorial Awards for Literature is oldest literary competition in the Philippines, and is that country’s equivalent of the Pulitzer Prize. “There’s an abundance of misfortune surrounding the characters in Marivi Soliven’s debut novel, The Mango Bride, which comes out April 30 from New American Library, an imprint of Penguin. The book’s already received attention in the author’s native Philippines, where, in 2011, it received the top honors for a novel written in English at the Carlos Palanca Memorial Awards for Literature, the Philippine equivalent to the Pulitzer Prize. The Mango Bride reads like a fairy tale gone wrong. The fortunes of a wealthy Filipino family are reversed and its members disgraced. Soliven’s examination of the role that class plays exposes how dysfunctional a society can be when the gap between the haves and the have-nots cannot be overcome, even when the passion burns up the page. 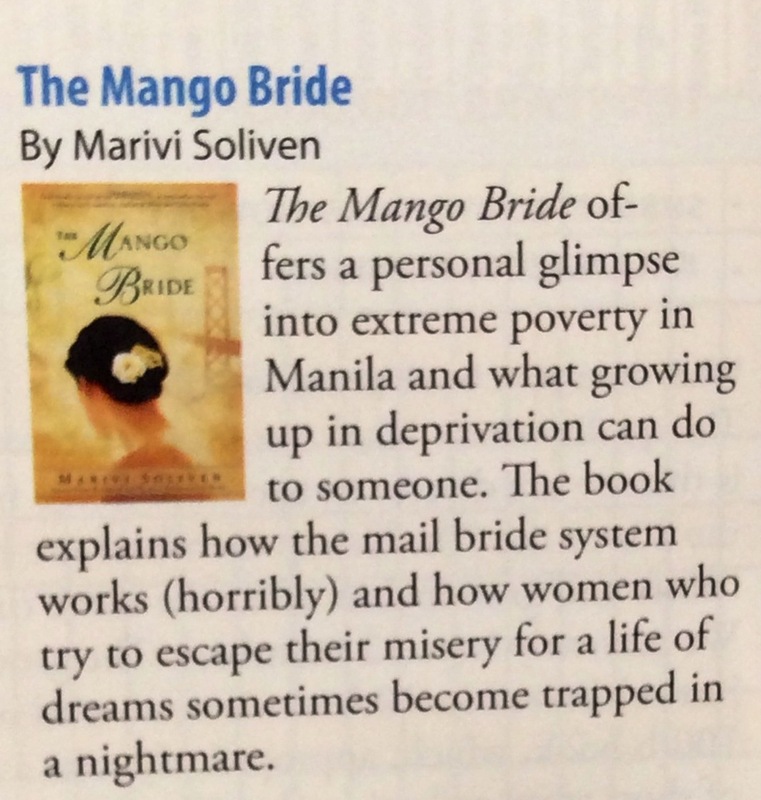 “Marivi Soliven’s “The Mango Bride” tells the intertwined stories of “poor little rich girl” Amparo, exiled by her wealthy family to the United States, and Beverly, a former waitress turned mail-order bride. As interesting as these central characters are sisters Marcela and Clara, veterans like Manong Del, socialites Senyora Concha and Carina, and the Filipinas that Amparo encounters in her job as telephone interpreter. Do not read the full review at the link below unless you want to know how the novel ends. “All families have their secrets, but in fiction, the wealthier and more powerful the family, the more secrets they keep. Make it a wealthy, fictional Filipino family, then you will have secrets that will inevitably come back to change everything. This is what lies hidden in the luscious heart of prize-winning writer Marivi Soliven’s first novel, “The Mango Bride” (NAL Penguin Books, New York, 2013, 371 pages), a cunning chronicle of the Duarté-Guerrero clan’s covert compromises and the resulting consequences. Quill says: Marivi Soliven deserves positive accolades and recognition for this captivating and engaging first novel. marivisoliven.com is the perfect blog for anyone who wants to know about this topic. You know so much its almost hard to argue with you (not that I really would want…HaHa). You definitely put a new spin on a subject thats been written about for years. Great stuff, just great! your feed and I am hoping you write once more soon! Hi my friend! I wish to say that this post is awesome, great written and include approximately all significant infos. are talking about! Bookmarked. Please additionally visit my site =). A friend of mine set up the website and he picked up the design from a WordPress template. He creates commercial websites and was kind enough to do it pro bono. Otherwise you can learn how to do it yourself, it will just take some time. Thanks for visiting! WordPress has a bunch of templates that you can use. A friend set this website up so I can’t advise you too much but there are instructions on setting up a website if you look it up online.